The Optuma custom tool programming allows users to code their own tools and functions to be used in the program. This module is included with an OptumaProfessional Services subscription. Other clients may purchase it as an add-on module from the Tool Store. The scripting language is based on Pascal which is easy to use and understand and is widely known. The syntax of the scripting language is outlined here. If you have any specific questions these can be posted to the Developers Forum. Click here and log in with your Optuma username and password. The programming functionality can be used to write a tool to apply to a chart or a function which can be used in scanning and backtesting. First open Optuma and open a bar or candle chart. Click on the New button and select Custom Tool from the menu. When creating a Drawing tool type, the Mouse Clicks option will appear. The mouse clicks field is the number of mouse click needed to apply the tool. For example if the tool was like a trend line it would require two clicks to apply, but if the tool was a triangle it would require three clicks to apply. 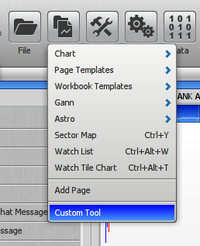 The window below will open when creating a custom tool is the Custom Tool Editor. To open the Custom Tool editor Editor apply the script tool and click the "Edit Tool Code" action in the properties panel. All the programming for the custom tool is done in this window. This is used to define the information about the tool. The Tool input parameter is the custom tool you are developing. Tool.MouseClicks: This the number of mouse clicks used to apply the tool. E.g. a trend line would need two clicks to apply the tool the start and the end of the trend line, while a moving average tool would only need 1 click. This procedure is called once when the tool is applied.It is used to initialise the tool. By default a Plot variable is added to the tool and some of its properties are set. The Tool input parameter is the custom tool you are developing. To add a drawing item to a tool, use the Addâ€¦ function for the Tool. E.g. Tool.AddPlot(). Drawing items are objects that are drawn on the chart as part of your custom tool. The following lists all the drawing items that can be added to a tool. A custom tool can have custom properties that are shown in the properties panel and can be set by the user and used in the programming of the tool. To add a custom property, call the Add.. function on a tool E.g. Tool.AddBoolean(). 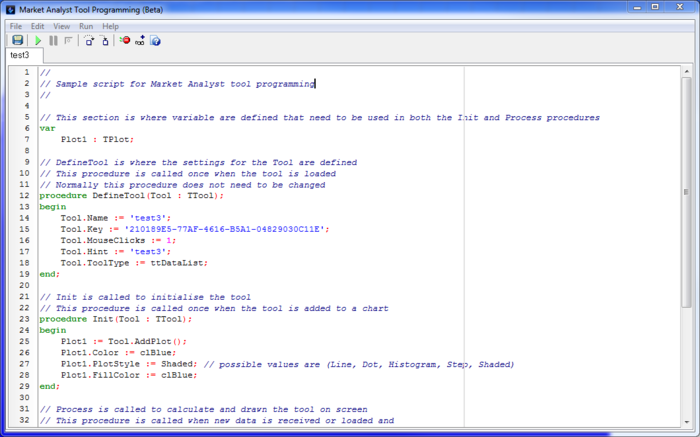 The following lists the Tool Properties that can be added to a tool. For more information on the tool properties, items see Tool Properties. Tool: This is the custom tool you are developing. ProcessStart: This is the start index into the DataIn Datalist (The DataIn index starts at 0). When processing the tool for the first time the value of ProcessStart will be 0. When processing a new bar from a tick on a live data chart, the value of ProcessStart will be the length-1 of the DataIn. This allows efficient processing of fast ticking live charts, because depending on the tool, when a new bar is processed whole datalist does not always need to be reprocessed. ProcessEnd: This is the end index into the DataIn DataList. This value will always be the length-1 of the datalist. DataIn: This is the input data for the Tool, it will normally be the datalist of the chart to which the tool is applied. E.g if the tool is applied to the DJI chart, then the DataIn will be an array of the DJI data. The following example is when creating a data list tool, like a moving average. The main objective being to create an output plot with the new plot data (Plot 1 in this example). As show in the default code, To access the data in the DataIn, it is common to loop through the datalist from ProcessStart to ProcessEnd indexing the Bar property. The following example is when creating a Drawing tool, like a trend line. The main objective being to create lines joining selection points. When adding a drawing tool, the user will click to apply the tool. These clicks are called selection points. To access the selection points use the Tool.MP array where Tool.MP represents the first selection point and Tool.MP represents the second selection point. Each selection point has three proerties Date, Price and Idx. To link a line to the selection points you need to set the date and price of the end points of the line to the selection points, as shown in the example below. If a chart is open when creating a custom tool, the tool is automatically applied to the chart. After making change to the code, to see the tool update with the changes click on the save button on the Optuma scripting editor (first tool button on the left). This will save the script and also update the tool on the chart. Once programming of the tool is complete, close the Scripting editor by clicking the red cross at the top right. To bring the Scripting editor back then click the Show IDE action in the properties panel after selecting the custom tool by left clicking the tool on the chart. Once the tool has been saved it will appear in the normal tool list and can be applied just like any other tool. Once you have the tool working the way you like you might want to give the tool to a friend or colleague. We are currently building a tool store where you can publish custom tool to give away for free or to sell, stay tuned to Optuma website for more information when this becomes available.